Although Devon, England may not have been on your radarscope as a destination to visit, it definitely should be added now. Although Devon, England may not have been on your radarscope as a destination to visit, it definitely should be added now. Devon is absolutely delightful, especially now that Bovey Castle on Dartmoor National Park, www.boveycastle.com, is open. This stately mansion, built in 1906, once the private home of Viscount Hambledon, son of W.H. Smith, has had a $50 million transformation and is now a luxury 5-star hotel. 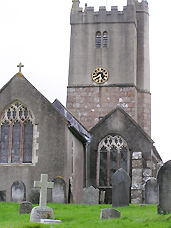 Located in the West Country, it is located on 368 square miles of Dartmoor National Park. 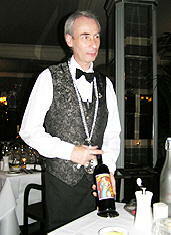 The hotel opened in April 2004, and Edward F. Nesta and I stayed at the hotel in November 2004. Traveling to Devon is easily accessible by train, as well as by car. Edward and I were traveling to England from Paris, and we first took the Eurostar train www.raileurope.com from Paris to London, and then took another train from London’s Waterloo Station to Exeter St. David’s Station, where a driver from Bovey Castle was waiting for our arrival. Guests may also travel from London’s Paddington Station, and the train trip is only 2 hours and 15 minutes. 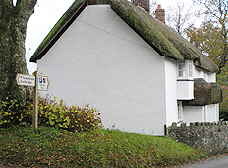 Although I have been to England numerous times, this was my first trip to the west part of England, and I was enchanted with the villages and the thatched roof houses that we passed. 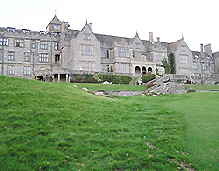 When we drove up to the gates of Bovey Castle, I was amazed at the open rolling hills and the vast moors, which called to mind the book, Wuthering Heights. Later I found out that the movie, The Hounds of the Baskervilles, with Basil Rathbone was filmed here. However, when we pulled up in front of the hotel, I was definitely impressed with Bovey Castle, with its imposing size and grandeur, yet when you enter, you are immediately struck by the elegant comfort of this gracious hotel. This luxurious 65-room and suite hotel has thought of everything to make their guests’ stays most memorable, from the Wellies (rubber walking boots that are de rigueur for country life) in the entry available for guests’ use, to the sloe gin that they make on the castle grounds that is offered to guests upon their arrival. Staying at Bovey Castle is like having the run of an English Manor Estate where you can indulge in a variety of activities or just snuggle up next to the fireplace in one of their several inviting rooms. 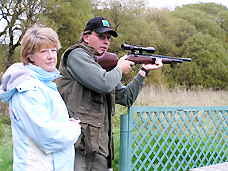 Guests looking for recreation have a choice of Archery and Pistol Shooting, Badminton, Boule, Falconry displays, Fishing, Golf, Horse Riding, use of Mountain Bikes, Shooting, Swimming, Sauna, Snooker, Tennis, Balloon Flights, Volleyball, Helicopter Tours, Sporting Clays, they can take a Dartmoor Safari or just simply take a stroll through the magnificent grounds to the charming village of North Bovey. There are also more sybaritic indulgences including Spa treatments, Wine Tastings, and of course, Afternoon Tea. We stayed in the magnificent Easdon Suite with a terrace overlooking the golf course and the moors, which you can read about in Hotels & Resorts. After settling in at the hotel, Edward and I took a tour of the spectacular grounds with Estate Manager, Ian Wylie. Fortunately, he drove us around the immense property in a golf cart, as he explained some of the interesting activities available at Bovey Castle. In addition to making their own cider and sloe gin, the hotel also keeps bees. Guests can meet the beekeeper, and while wearing protective gear, they can gather their own pot of honey, certainly something that seemed most unusual to me and yet, could be very interesting. 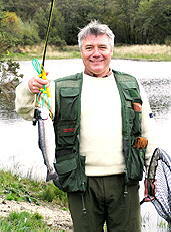 Bovey Castle also has its own river and lakes where guests can fish for salmon, as well as blue trout and rainbow trout. The hotel has a coop where they keep chickens and quail, and children can gather their own eggs. He told us that the children especially love to gather the tiny quail eggs. In the summer, guests can bring a little romance back into their lives with a game of croquet on their well-designed croquet lawn. The golf course, built in 1926 by J.F. Abercromby has had a $10 million renovation and is absolutely remarkable with its long fairways and rolling greens. Although Edward and I did not have time to play a round or two of golf, we did get some practice on their immaculate putting green. We returned just in time to indulge in Afternoon Tea in the Cathedral Room, which is a splendid room with a soaring ceiling, gleaming dark wood, and two chairs set beside the enormous ornate fireplace that provided the perfect cozy spot to enjoy Afternoon Tea. The room also has several sofas, chair clusters and window seats that allow guests intimate areas for tête-à-têtes. Afternoon Tea offered large perfect scones, tea sandwiches, and delicious cakes that were almost too beautiful to eat, but guests did manage to eat them, all the same. Teapots covered with pretty “tea cozies”, kept the tea piping hot. Edward loved the Bovey Castle Devonshire Cream Tea Scones, and looked forward to Afternoon Tea each day to sample a few more of them. (Executive Chef David Berry shares the recipe for his scones with Luxury Experience Magazine readers in Chefs' Recipes.) We returned to our suite, relaxed on our terrace, and then changed for dinner, which was preceded by a Wine Tasting. After our interview, we had dinner in the elegant Palm Court Dining Room which featured Chinese silk fabric on the walls, crisp white linens, tea lights glistened on the tables, which were set with silver charger plates, white Villeroy & Boche china, and German crystal. Edward selected the Globe artichoke salad with poached egg and truffle, which was artistically presented with a piece of bacon rising out of the globe artichoke like a feather, and the poached egg was encased in a batter. I selected the Steamed paupiettes of lemon sole with lobster and herb mousse and a saffron cream sauce, which was sole rolled around the lobster and herb mousse and served with small-diced vegetables in a very well balanced saffron cream sauce, which using our knowledge from the Wine Tasting, we paired a 2003 Soave Classico Superiore, Leonildo Pieropan, Vento, Italy, which was light, crisp, and refreshing. For our main courses, we selected the Roast loin of venison with celeriac puree, pancetta, buttered Savoy cabbage and pepper jus, and the Char-grilled Mediterrean vegetables with deep fried polenta cake and basil, which were perfectly paired with a 2001 Il Circo Uva di Troia “La Violetta”, Randall Grahm, Castel del Monte, Italy, according to John’s recommendation. After dinner, we went to the Oak Room and Piano Bar to listen to the music and have a cocktail by the fireplace. We chatted with Loris Speltini, the Head Cocktail Bartender, and who is the creator of the cocktail “The de Savary Affair” named after Bovey Castle owner, Peter de Savory, which I had to try. It was a tantalizing mixture of peach liqueur, framboise liqueur, grapefruit juice and Tattinger champagne and garnished with a raspberry, while Edward indulged in a Dry Rob Roy. The next morning we had breakfast in the Palm Court Dining Room, where guests could order off the menu, or select from the buffet, which offered the “full-English breakfast” and then some. Think porridge, bangers (translated bangers are sausages), tomatoes, mushrooms, fresh fruit, eggs, ham, West Country cheeses, cold cereals, juices and the list keeps going on. We finished our breakfast just in time to see the Falconry Display on the Terrace. Each morning, Martin Whitley, puts on a display with his falcons, hawks, and owls for the guests who eagerly line up on the terrace to witness these spectacular birds. 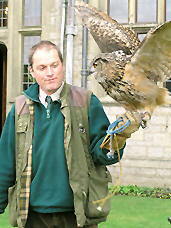 He began by showing Merlin, an owl, followed by Baby Moses, a 10-week old Barn Owl who stole the show. This small owl, had a very sweet disposition, and guests were allowed to pet him, which he seemed to enjoy. His feathers were as soft as velvet, and he kept flying back to me on his own accord for more petting. Hector, a Harris Hawk, had the amusing habit of flying up to the window ledge of our suite during the display, as apparently that is his favorite spot to roost. I was a bit concerned though, since the window was open, and I had visions of Hector entering and then flying away with an article of clothing! Imagine trying to track down a hawk. Galahad, a 3-year old falcon, amazed the crowd as he soared on Martin’s command to “catch” his “prey” (actually a leather pad on a string that Martin hurled in the air). Martin said that Galahad, formerly called, Sir Galahad, (who lost his title when he decided to fly away to another village, and Martin and to drive to pick him up), can fly about 280 – 300 mph! After overindulging in lunch, we went to the pool to have a swim and met a very charming couple and their very young daughter, Sophia, who thought that the Jacuzzi was her own private pool. Sophia, already quite a charmer, and not yet 2, graciously allowed us to share her “pool” after we took a few laps in the pool. We returned to our suite to get ready to participate in making a “Guy Falkes” effigy for the Bonfire that night. Guy Falkes is a celebration that takes place in England on November 5th. We went to the Reception Desk and found that we were the only ones who had shown up, so off we went with Dave Kimberley from the Activities Staff, to build the effigy. We had a ball, as we created the effigy with corduroy pants, a bright orange long sleeve shirt, made his head from a stocking, then added a baseball cap, added a bit of red “hair” made from tissue paper, drew a face on a sheet of paper, then added the finishing touch, a silver shoulder bag, that was donated by one of the staff members. Our “Guy Falkes” was quite the character, and we were rightly proud of our creation that would be tossed on the bonfire later that night. At the appointed hour, we walked down to the bonfire, with Dave carrying “Guy”. Several of the guests we passed were quite surprised as they spotted “Guy”. The bonfire was an amazing creation created by Ian and Dave, who used everything to build the bonfire, “except the kitchen sink”, but did use several discarded doors from the hotel. Our effigy was placed on top of the bonfire and then Ian with a sparkle in his eyes lit the bonfire. Let the celebration and the revelers begin! 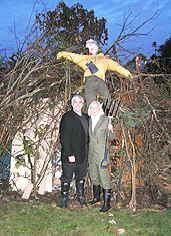 As the guests made their way down the hill to the bonfire, they were greeted by Executive Chef David Berry’s staff, who offered guests hot mulled cider and hot chocolate to keep warm on the chilly November evening, as well as jacket potatoes (jacket potatoes translated are baked potatoes), hot dogs, hamburgers, lamb skewers and candy apples. When the effigy had at last burned out, we made our way back up the hill, and were glad to burn off a few calories before we went to dinner. We once again dined in the Palm Court only on this night we restrained our selections to the entrées only. We selected the Pan fried John Dory with creamed leek, and smoked salmon with a wild mushroom cappuccino and the Seared duck breast with crushed black peppercorns, roasted beetroot and cherry apples. 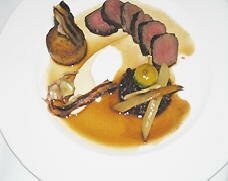 In addition to the chef’s more creative dishes, he also offers more traditional fare each evening in the form of a carved meat served from a trolley, and comfort food, which he calls “Adult Nursery Dishes”, which consisted of Devonshire braised beef stew which was on the menu the previous evening, and this evening’s selection of Toad n’ the hole with onion gravy. After dinner, we went up to our suite to watch the Guy Falkes fireworks display from our private terrace. Although I always love fireworks, they were especially magnificent over the dark moors, providing a perfect ending to a perfect day. The next morning we had breakfast bright and early, so that we could once again see the Falconry Display, before we had our fly fishing lesson! Edward, dressed in a Burberry trench coat and wearing Wellies, and I, dressed in a camel hair jacket, and Wellies, met up with Instructor Tony Murphy. After looking over our attire, since outside of wearing the Wellies, (which were on loan from the hotel), we were not really dressed for fishing, he provided us with baseball caps and offered us sunglasses, which were to protect us from flying fish hooks. He patiently explained the techniques of dry fly fishing and wet fly fishing. 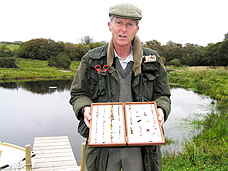 You use a dry fly, which looks like an insect to float on the water, trying to match the “fly” with the other real “flies” at the site. The “fly” is oiled which allows it to float. “Wet” fly fishing uses a “fly” that imitates an insect or tiny fish that sits under the water, and you give the “fly” a bit of movement. He then told us that it is important to match the line, made of fine nylon, to the size of the fish that you are trying to catch, and then length of the rod, which was about 9 feet. He instructed us to hold the rod loosely, make an overhead cast, pulling the line high in the air backwards and then casting it forward to throw the line and place it gently on the water. Believe me, it sounds easier to do then it is, but with practice, (about 100 casts), and we were in the fishing business! At least we looked the part, (save the Burberry trench coat and camel hair jacket), while we patiently kept casting our lines in the water trying to tempt the fish with first “dry” and then “wet” flies. After quite some time, Tony decided Edward should probably try a different “fly”. Just at the moment Tony was swapping the fly, lo and behold, a fish popped up right in front of Edward, and I truly believe that I heard the fish laugh as he swam away! With that, we all laughed and decided that we should call it a day. That’s the beauty of fishing I guess, sometimes you catch a fish and sometimes you don’t. However, being outdoors is always very relaxing and enjoyable. Tony described a day where he had been out fishing on a glorious autumn day where the light played on the autumn leaves and suddenly a kingfisher passed by and he was mesmerized by the dappled light on the iridescent feathers of the bird, and was quite caught up in the moment. He wondered if the kingfishers ever traveled in pairs, and suddenly there appeared a second one. Although he did not catch a single fish that day, it a most memorable one, I guess that it why people enjoy fishing. Although we left empty handed, Kevin James, another guest at Bovey Castle caught a beautiful large trout while we were fishing, and to prove that it was not a “fish story” I took his photo with his fish! Next on the sporting agenda of the day, was Archery with Ian and Pistol Shooting with Instructor, Chris Hurford. We divided into groups of four to try our hand at Pistol Shooting, and then at Archery. Edward and I were divided into a group with a delightful couple, John and Kathy Walker. We first tried shooting air pistols, which I enjoyed hitting the balloons and then later the other targets set further away. Our group really got the hang of it straightaway and it wasn’t long before we burst all the balloons and hit several of the targets. Although I thought pistol shooting was fun, I really liked rifle shooting, which was easy with the help of a scope with a site and a gun rest. I almost dreaded Chris going to retrieve my target to see how I had done, but I laughed in delight to see that I had not only hit the target, I also hit one bulls eye and had 3 more shots in the black area on the International Shooting Union 10-Metre Air Pistol Target, (which we used for rifle shooting)! I had to check my score against Edward’s since we always have a bit of a competition between us, and he too, hit one bulls eye and also had 3 shots in the black area, although one of mine was closer! Kathy and John also scored quite well, but when Chris shot he put us all to shame, placing all five of his bullets in the same place! Kathy looked like a professional at archery when she hit the bulls eye of the target. Unfortuntely, Archery did not really suit my skills, but I did manage to hit poor Hugh Grant in the neck, and I was quite proud of myself, as no one else in my group managed to hit him. Before you get the wrong impression of Bovey Castle though, I would like to mention that the target was only a replica of Hugh Grant’s head. Buoyant, after our successes at Shooting and Archery, Edward and I decided to take a stroll into the village of North Bovey. We enjoyed our walk through the castle grounds until we came to a wooden stile at the edge of the property and didn’t know how we could continue our walk without climbing over the stile. However, since we did not want the owner of the adjacent property to think that we were trespassing, we hesitated at the stile, until we saw a man walking his dog. We waved to him, and he came over and told us that the stile was put there to keep out large animals, but that it was perfectly acceptable to climb over the stile to continue on our walk, so we climbed over the stile. Edward had a bit of a chat with Bob Rose, while I played with his dog, Daisy, who took one look at me and knew that I would play fetch with her. I tossed a few sticks and Daisy fetched, before we parted with our new friends to proceed on our walk to North Bovey. The village of North Bovey was picture-perfect with thatched roof houses, St. John the Baptist church which dates back to the 13th century with a cemetery attached filled with Celtic crosses, and we also made a stop in the Ring of Bells, a 13th century inn, where the ceilings are so low that taller guests that must bend to enter. We stopped frequently on our way back for photographs, as we made our way back to Bovey Castle. On the return trip, when we approached the stile, we just climbed right over. That evening, we went to dinner at The White Hart, www.whitehartdartmoor.co.uk, in Moretonhampstead to experience more of the Devon countryside. 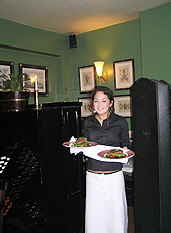 The White Hart is not only a restaurant it is also a small hotel. Upon entering the restaurant, we had a lovely surprise when we were greeted by Bob Rose, (minus Daisy), who was at the restaurant for his annual lawn bowling dinner. He invited us to join him in the bar for a drink before we each went off to our respective dinners, so we did. For our dinner, we began with calamari and prawns and scallops on a rosemary skewer with rocket salad, followed by lamb and crespoline pasta, which we paired with a 1999 Riscal Tempranillo de Castilla y Leon. For dessert, our charming server, Angela Francis, insisted that we try their homemade ice creams, coconut and rum, Tia Maria and Mint, and Champagne sorbet, which were really very good. After dinner, we ran into Heidi and Marcus, Sophia’s parents, so the four of us went back into the bar where we were joined once again by Bob Rose and his friends. Bob’s friends were certainly surprised when he told them how we had met. Everyone had a great time, and it turned out that Marcus, who lives in London, and one of Bob’s friends had a common acquaintance. The storytelling went on for quite some time, before we remembered to call our driver to pick us up. 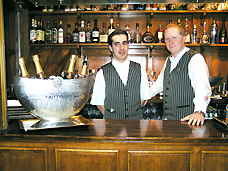 We ended the evening in the Oak Room and Piano Bar at Bovey Castle, which was brimming with guests for a last nightcap. In the morning after breakfast, we would leave on the train for London, with our luggage filled with wonderful memories of our time at Bovey Castle and Devon. 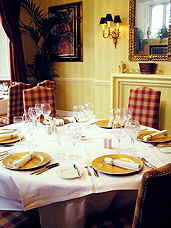 Read our other articles on Bovey Castle and London in Hotels & Resorts, Wine Cellar, Restaurants, and Chefs' Recipes. © March 2005. Luxury Experience. www.luxuryexperience.com. All rights reserved.